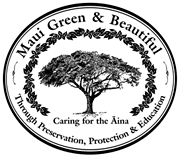 Maui Arborist – Trees and Landscape Decisions | Bananas, a Large Selection to Choose From. Bananas, a Large Selection to Choose From. I haven’t met a person who did not like to eat bananas. It can be eaten any time of the day and be prepared in many different ways. One of my favorite lunches is a peanut butter sandwich containing a banana sliced lengthwise. One sandwich will “stick to your ribs” all day. One needs to be creative to use home-grown bananas because it is either feast or famine. Neighbors and relatives benefit; drying preserves them for future snacks. Our favorite is the ‘Brazilian Banana’. A peeled Brazilian weighing 100 grams, contains 118 calories, mostly from carbohydrates, vitamins A, B, and C, calcium, phosphorous, iron, protein and 370 mg of potassium, which is 15 % of an adult’s recommended daily allowance. Have you seen what bananas sell for in the store? At times one bluefield banana costs about 42 cents. Those with yard space could easily plant one or two plants. Bluefields – susceptible to Panama wilt (a soil borne fungus) and does not withstand strong winds very well. They are the beautiful, large, yellow, imported bananas you see for sale in the stores. They develop massive, thick trunks. ‘Bluefields’, height 20 feet or more, and bunches weigh 60-100 lbs. ‘Dwarf Bluefields’ (Cocos), height 10-15 feet, and bunches weigh 60-100 lbs. Brazilian – height 20-25 feet, bunches weigh 20-45 pounds, the plant withstands wind better than most and is tolerant to Panama wilt and Burrowing nematodes. They develop massive, thick trunks. Because they taste and look like a large ‘Apple Banana’, and the tree grows a little shorter, they are erroneously called ‘Dwarf Apple”. Cavendish – tolerant to Panama wilt. ‘Chinese’ with a height of 7-10 feet and bunches weighing 40-90 lbs. It is susceptible to fruit “Freckle” (a fungus), and Finger-tip rot (a fungus). ‘Williams’ with a height of 9-12 feet and bunches weighing 60-100 lbs. Plants may need propping due to the heavy bunches. It is susceptible to Freckle and burrowing nematodes. ‘Valery’ (Taiwan) grows to a height of 10-15 feet and has bunches weighing 60-100 lbs. It tolerates cool temperatures and may need support due to weak stems. There are other dessert bananas but the “Apple”, or Lady Finger, is my favorite. Plants reach about 25-30 feet tall, develop massive, thick trunks, and bear small bunches that weigh about 25-45 pounds. The fruit have long tapered tips similar to the ‘Brazilian’. Cooking Bananas or Plantains, Musa balbisiana. There are many different types of “Cooking” bananas. The fruit are usually short, fat, and starchy. Cut them in halves, pan fry in a little butter, and sprinkle them with a little brown sugar. You can also fry ripe dessert bananas; they become mushy-soft and very sweet. The Cuban Red banana is an exception because it can be either cooked or eaten raw when ripe. It is a beautiful tree because the trunk, leaf petioles and midribs are dull red in color. The fruit ripens from red to yellowish red. The plants grow to about 20 feet tall and are tolerant to Panama Wilt and burrowing nematodes. If anyone has a Cuban Red Banana plant with a bunch of large red fruit, call me at my office (242-1285). I would like to photograph it. There is a variegated form of the cooking banana. Both the leaves and peel have white streaks. Some of the bananas growing in the wild have seeds. Fortunately for us the ones we eat do not develop seeds. I grow the ‘Chinese’ banana – doing very poorly due to shade, ‘Brazilian’ (dwarf-apple) – excellent production, ‘Williams’ – fruiting well, ‘Cuban Red’ – new plant, and a novelty called ‘Hapai Banana’. 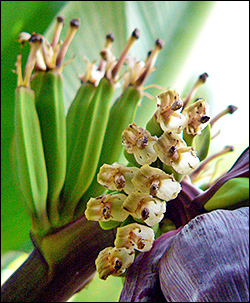 The book, In Gardens of Hawaii, describes this particular banana as a curious form that “bears small fruits which mature within the trunk”. The trunk is supposed to become swollen and ruptures for harvesting. The plant has the appearance of being pregnant. A friend gave me a plant, and it recently had its first bunch. Much to my sorrow, it did not develop the swollen trunk but produced the bunch out the top, the normal way. I guess it must be on the “pill”. The fruit tasted like the ‘Williams’ but did not have much shelf life. Maybe the environmental conditions affected the tree’s “birthing”. The ‘Brazilian’ bananas sell for higher price in the store. They are not bland in taste and have a long shelf life. My bunches have as many as 13 hands. I wanted to expose you to the more common banana cultivars so that you can select those that meet your requirements. 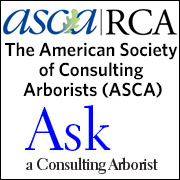 Before deciding, read the next articles because they will deal with planting, caring, harvesting, pests and diseases. Meanwhile, buy some of the different types of fruit from the store and give them the taste test. Try some of the cooking cultivars. Consult a local cook book for ideas.